A hallmark value of the Suzuki learning community is our commitment to lifelong learning. Shinichi Suzuki believed that we become teachers at one hundred years of age, and until that point, we are all students. Need some encouragement for repeating a unit course? SAA-Registered teachers who have done just that share their thoughts below. I take unit courses multiple times to learn with different teachers, not necessarily with a book. A good teacher trainer teaches about teaching and the mechanics of the violin. A good trainer does not necessarily teach the “correct” way to teach a book. No. He expands your understanding of priorities, of what skills need to be introduced when. He gives you the confidence and freedom to teach your way, and he helps you understand about relationships. I have been teaching for almost fifteen years and will never tire of taking courses. I always learn something. For me, if I had not been taking a new book every few years, several things could happen. First, I might quit from being bored or dissatisfied. Second, my students will suffer from my complacency. I used to wonder why certain things didn’t work for me and I tried to find the answer within my own experience. This has its limits and if I never get outside help, this self reliance can be dangerous. I can become autocratic and rigid. I gain the answers to my teaching problems from training. I also find taking lessons occasionally gives me the perspective I need to stay alert when teaching. I also suggest non Suzuki pedagogy like Paul Rolland, Ivan Galamian, and Simon Fischer. Sign up for blogs like violinist.com. Unfortunately, like a lot of things in life, if you are not growing, you are not just staying still, treading water, you are regressing, dying inside (no, I’m not being dramatic!). As Martin Luther says, life is not about rest, but about action. I would not be the teacher I am without this training! Thank you! Even though I have been teaching for more than thirty years, I have so much more to learn! I can’t imagine a year without some sort of continuing education. For that reason, I continue to take units, most multiple times. Although the music is the same, the trainers are not. Each time I re-take a unit, I get something new from it. Each teacher has a unique approach and style. I come away from every institute experience rejuvenated and ready to jump into the new year with fresh ideas. It is such a boost to my teaching! As director of the Intermountain Suzuki String Institute, I feel that teacher training is the most important thing that happens at an institute. The training that teachers absorb each year goes on to influence all of the students they will teach in their life, often hundreds. Every trainer has a completely different presentation of the material in each book. Each book class is a different class, depending on the trainer that is offering the class. When I was a young teacher starting my training, I made friends with a fantastic young teacher, Ellie Albers (LeRoux). Ellie was like a sponge, soaking up everything Doris Preucil was saying in our Suzuki Violin Book Seven class, back in about 1982. Ellie had so many intelligent ideas to add to the discussion in the class. She told me it was her third time to take Book Seven, and that she tried to take each book from several trainers. I watched over the next few years as Ellie became one of the best trainers herself. She taught me a great lesson that week, the importance of Lifelong Learning, and what it really meant. I try to take a class every year, and plan to until I don’t teach any more. I am in my thirty-second year of taking teacher training classes. As a cello teacher I find that the pieces you work on the most are Volumes One and Two. Even with more advanced students, you always return to those pieces. Taking those courses many times with different teacher trainers, or even with the same, has the same effect as reviewing a piece after learning it for the first time. It is fundamental! The first time you take a course, you just met it. But if you want to fall in love, repetition is what you need! Continuing education is important in order to not only remain connected with other teachers and to stay up to date on latest ideas, but most importantly, continuing to learn and grow so as to effectively serve our students over a long period of time. I am glad to say that I am a completely different teacher than I was twenty years ago. I have come to believe that how we related to our students and parents is as critical as the material we are presenting. This depth of interaction stems directly from continuing education and mutual sharing of teaching ideas—accomplished by attending workshops, institutes and of course our SAA Conferences. I think it is important to cover all ten books, but I also think it is equally important to re-take books with different teachers. I actually keep a list of teachers with whom I would like to take a course. I think many teachers do not re-take books because it is expensive and sometimes difficult to take the time off to attend an institute. It isn’t a luxury though. It is something we must do to. It is something we must budget into our annual studio expenses so that we can be refreshed and renewed, and so that we continue to build the repertoire of ideas we offer our students on a daily basis. I think that with any other profession, it is important to keep up-to-date on the training being offered by the SAA. Also, by getting training from various teacher trainers you gain new ideas and perspectives on how to teach some of the same teaching points. I refer to the various ways in which I can approach a teaching point as my bag of tricks. For every student I encounter I may need to pull many tricks from my bag until I find one that really fits with that particular student. By getting more than one training course from more than one teacher trainer, I am increasing the amount of tricks I have to offer to students—and in turn am increasing my level of successful teaching. There is one more important aspect to getting more/consistent training: my sense of community and involvement with the SAA increases with every course I take. I feel more involved, more connected, and create friendships with fellow teachers that have lasted for years. It’s nice to have relationships with people who can relate to the ups and downs of being a Suzuki teacher! Taking a unit course multiple times is invaluable. Every course is a unique experience; each teacher trainer shares a different perspective and members of the class can often contribute to enlightening discussions and topics. I have taken classes with people from every walk of life. People who are coming back to teaching from a new perspective, master Suzuki teachers who just want to reflect with their colleagues, new and excited musicians new to teaching, people who teach in inner city school systems, etc. Interacting with different teachers is one of the things that I most treasure. Teaching is not black and white, and no one is the same person or teacher at each stage of his/her development. Taking a course later with experience having taught and worked with music on a pedagogical level adds depth to one’s understanding. In coming back to a course that I have already completed, I arrive with a set of understandings of how to teach the pieces, how the material is structured, and with my vision of who my students are at this level. Revisiting material in a course often completely changes my views and forces me to reflect on where to go next in my teaching. It is through these shifts in paradigms and challenges to what we think we already know that we learn and evolve. As Suzuki teachers, we must review and reflect on our teaching in the same manner that we have students review and refine pieces in their repertoire. We need to study and add layers of experiences and understanding as we progress as teaching professionals in order to uphold the highest standards and keep the Suzuki method alive and relevant to today. It is my belief that the Suzuki approach to education goes much deeper than learning the repertoire and taking repertoire Units. Serious teachers in Suzuki need to keep in constant contact with other teachers and trainers in the Suzuki world. Each Unit Level or other class that youattend brings its own unique experience. Even in a specific Unit there are no two that are alike. The experiences and philosophies of each individual participating strengthen those in the class. Suzuki has implored us that in order to continue to grow in our teaching ability we need to continue training. As a trainer for the SAA for forty years, I still attend classes—especially those featuring the teachers from Matsumoto—and find new ideas or renew and improve my teaching skills. At the fall recitals this school year, I noticed a marked improvement in tone across the studio. How did the change occur? By using bow exercises fromthe Book Two unit course I took last summer! Even though I was teaching at the institute, they figured out a way I could audit the class. Boy, am I glad I did. Every student in my studio of forty, no matter what book, has benefitted from my fresh enthusiasm for bow technique. My first time for the Book Two unit course was in 1997! The SAA’s teacher development program has been absolutely invaluable to me! I did not go to a school that offered long-term training, and I also did not receive my master’s in Suzuki pedagogy. I am from a performance background. I wanted to replicate as best as I could this long-term experience for myself, so I took several units in a row with several teacher trainers over many years in order to study in depth with each trainer. Of course this meant repeating several units several times over, but I was happy to do it. Each time I would get something different out of the experience; perhaps it was because it was with a different trainer who had a different background, a different technical vision for students, or different priorities in teaching. Maybe it was me that was different each time: a different age, greater experience, in a different place in my teaching. In any case, repeating units is a practice that I will continue indefinitely. I take very seriously Dr. Suzuki’s challenge to commit to lifelong learning, and of course this will take many different forms: workshops, Conferences, participation in other forms of training, and learning knowledge from other disciplines—but for me it also includes repeating units. As a teacher, it is essential to stay fresh with new ideas, to remain current on one’s information, and to be up-to-date with the latest ideas about teaching. For me, this certainly means that just because I once studied a unit ten years ago that I will continue to teach it the way I learned ten years ago! The Suzuki method continues to evolve and grow, and my constant training is a part of that process! Way out here in Hawaii, we jump at the chance to have teacher training courses at our Institutes. I have studied most of the books at least three times, and I love repeating them. I always walk away with new ideas, fresh perspectives, good exercises, fun anecdotes, and new ways to spice up my teaching. It’s always great fun, a good way to meet and bond with other teachers, and it’s always a good review and keeps me on my toes. I have never regretted retaking a teacher training course. Get out there and register now! You get to experience the wisdom and teaching styles of different teacher trainers. Going through the same material, but with someone else’s individual method, is incredibly broadening. Working with someone whose teaching style most nearly mirrors one’s own is very helpful; working with someone whose teaching personality and style are quite different from yours opens you up to a whole new range of teaching possibilities, and ones that don’t necessarily come “naturally” are no less valuable. The range of expertise and creativity in our wonderful teacher trainers is so wide and so varied, the creative buffet is too delicious and too filling to miss. And once through the line just isn’t enough. Taking a book class for the first time is exciting and fun. Taking a book class again, after you have been teaching that book for many years, is exciting and fun, but it’s also a far richer, more multi-layered experience. You are able to explore the material, and the real issues that come up in teaching that material in a hands-on rather than theoretical way. It is a wonderful battery re-charger! Though it may seem counter-intuitive, doing a book class on material that is beginning to feel as though the creative well is running a bit dry is one of the best ways to re-invigorate and re-inspire. Finally, if the Suzuki community really means to foster a commitment to lifelong learning, there is nothing better than leading by example. We all benefit. The years of teaching accumulate. The number of families whose lives we touch becomes innumerable. One would think that teaching should become easier with so much experience. And in some ways it does. But I find that the more I learn about learning and about children and about music, the more complex the job becomes. Each time I repeat a course, I reap from it a new level of understanding because I enroll at a new level of understanding. I take away a new appreciation for the complexities of the material and for the richness of the art of teaching. Each student in my wake will experience a lifetime of music through the veil of my ability to help him/her learn. It’s an awesome responsibility and I owe it to them to polish my teaching in the same manner in which I ask them to polish pieces. Every time you take a course over again, you are in a different place in your own teaching. As you develop as a teacher, your needs in teacher workshops change drastically. Every time I take a course over again, I hear it differently—sometimes because the teacher trainer is different, but usually because I am. Summer Institutes are one of the most brilliant of the Association’s many learning tools. While I am sure that there are many excellent and different styles of teaching with all the Teacher Trainers available, I have been blessed to be mentored by many years of studying with Peggy Swingle. She always teaches every unit in such a way as to make each of us think about how we can teach all the points better each year. Never do we study a book and assume we have “arrived”; we are never stagnant in our learning. If studying a piece in Book Five, we will see where that point was introduced in Book One or Two and see how we could develop the skill through Books Three and Four, making it easier to master in Book Five. For me, this emphasis makes me teach more holistically. All participants are valued for the experience that each brings making the discussion rich and full of good ideas. The discussions about what worked and what didn’t work so well that year are so valuable. I strongly encourage all my students to attend Institute each summer. Once they go, they are hooked! They will review happily to be ready for group class. To be able to play in the recital on the big expensive Bosendorfer piano is a real honor, so the recital piece gets very special care. So if I am working so hard to have my students go, why would I not go? I am so pleased to see the results of all our hard work. I can give encouragement to my students during the week. When they see me come observe their master class lesson or their group class, it makes them feel special and I know what points the teacher has presented and can do much better follow-up after Institute, making the experience more profitable. So why repeatedly take the same book? Because we are always learning, always trying to better our teaching, always needing to encourage each other. We could ask ourselves why do we teach the same pieces to every student? My answer is that I am not teaching pieces, I am teaching a particular child and the vehicle is the piece. I simply go to Institute to find new ideas, spend time with fellow teachers, and soak in the energy that so permeates the campus. In other words, it is to recharge my batteries for another year of teaching. The particular book is just the vehicle by which that is accomplished. The week gives me the time to reflect on my teaching. Every year I make a list of goals for myself and my students. Then at some point during the year I read them again and evaluate the progress made. I am so thankful for all my years of attending (since 1989!) the Oregon Suzuki Institute and for the excellent leadership Kathie Reed and Cynthia Scott have provided. Continuing education is very important to me, as it helps me to stay focused on good tone production, technique, musicality as well as keeping Dr. Suzuki’s principals fresh in my mind. I attempt to take or retake short term training classes on the Suzuki repertoire, either as an auditor or participant, on a yearly basis, gaining new insights into teaching and applying the Suzuki Philosophy in my studio. Every teacher trainer and each group of trainees offers a different perspective on the pieces being taught. Also, observing many master classes adds to the arsenal of ideas for me to use in my own studio. Revisiting a course, after having taught the material for a few years, gives me a different perspective on the pieces; where they might be challenging for a student, etc. Why did I decide to retake a course that I have already previously registered? Personally, I feel that as Suzuki teachers we are always learning. There isn’t necessarily a best way but often times a new way to teach a skill. Each teacher trainer has their own ideas and ways of doing things that we can always learn from and sometimes even change it to fit our own style of teaching. I have enjoyed every training experience and look forward to more in the future! The SAA’srequest to write “why retake a teacher training course” put a smile on my face! I actually did a “promo” speech last summer to the younger participants in my Book Three class with Edward Kreitman about the fact that one unit of teacher training at any level does not give you all the answers! You need to take what you learned back to your studio, apply what you learned, find out not only what works for you but also what isn’t working for you, come up with more questions, then take the unit again. To give you an idea of how long I’ve been doing this, my first institute was in 1975! At this point I think I have attended over 20 institutes! Historically, in the ’70’s we were told as trainees that the SAA was not going to “certify” teachers. At that time, it was felt that if we went the direction of our European counterparts by certifying “Suzuki teachers”, those receiving certification would not return to institutes after taking a single course at each level. The SAA wished to encourage life-long learning and networkingas well as continual expansion of the method. 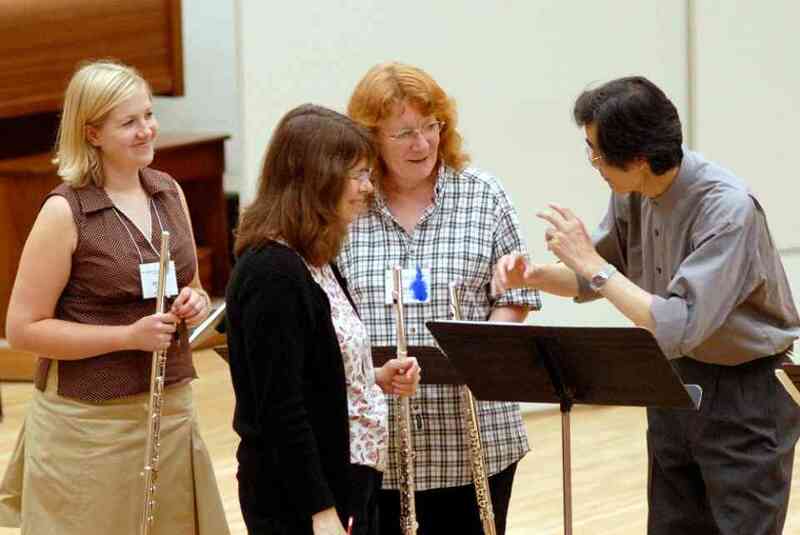 Just as public school music teachers are expected to continually take courses to renew their teaching certificate, Suzuki teachers were encouraged to do the same. Returning to an institute to take teacher training is like playing the party game “telephone.” By the time the information gets to the end of the line, it has mutated. In the case of institutes, the mutation is for the betterment of everyone who takes a course. Each teacher trainer has had the benefit learning from the teacher trainers a generation, two generations, or even more generations ago. Each progression of information passed on raises the bar as more insight and more layers go into the study of not only the repertoire itself but also the study of how children learn. Watching the most experienced trainers teach children is so exciting, but what is becoming even more exciting is where the younger teachers are taking the movement with their new energy and experience. We now have a group of excellent, young Suzuki institute teachers who grew up as Suzuki students! However, it is not just what happens in the classroom with the great SAA teacher trainers that draws me back over and over again. It is the daily parent talks, teacher lectures, technique seminars, student recitals,enrichment opportunities and the chance to network with other teachers (and parents!) about their ideas, their successes/failures and their questions that make returning to an institute so vital for renewing my energy every fall. Ithelps me keep the balance between teaching the Suzuki repertoire with a traditional approach and teaching the repertoire with a Suzuki approach! I view taking teacher training as a professional responsibility. It not only makes me a better teacher—it raises the confidence of my students and parents that I am a Suzuki teacher, not just a music teacher using the Suzuki books! I have taken several teacher training courses more than once, just to have the opportunity to learn from so many excellent teacher trainers! Every teacher trainer remains highly skilled as a teacher and a musician. In addition, every teacher trainer demonstrates different strengths and emphases. It directly benefits my own teaching to receive new perspectives, ideas, and inspirations from many different teacher trainers. And finally, this training helps energize my own creativity and motivation, as well, helping me feel energized and enthusiastic about teaching this repertoire, year after year. Three summers ago I took a Book One course at the Ithaca College Suzuki Institute. It was my second time taking the course since my long term training a few years before and it was the best thing I’ve ever done for myself. I knew going into the course that I would have the opportunity to develop my bag of tricks with greater sophistication since my introduction to Talent Education. With the basic information already under my belt I found myself diving into the philosophy of Dr. Suzuki in a way I wasn’t able to do in the beginning. Aside from making new friends, finding a mentor in Sally Gross, and having the opportunity to observe some terrific teaching, I watched my teaching grow over night. I recommend every teacher take the opportunity to experience a new set of tools and perspective that is offered from the various teacher trainers. I have made it my obligation to learn from as many of the incredible educators that have been affected by the life of Dr. Suzuki as possible and encourage you to do the same! I first registered Books One through Eight as part of the long-term teacher training program at The School for Strings, under the instruction of the great Louise Behrend. It was Ms. Behrend herself who told my class that the best violin studio teacher she knew was Ronda Cole. I went to observe Mrs. Cole teach at her home studio in Virginia, and I was so impressed that I moved to the area to pursue a private apprenticeship with her, during which I registered Books One through Ten. I will be forever grateful to Ms. Behrend for recommending Mrs. Cole, and I think it is a testament to the cooperative spirit of the Suzuki community. Over the years I have returned to Summer Institutes to retake a unit of training I had already registered with SAA with a different trainer. I always feel these are greatly beneficial as they allow you to review a unit from a different point of view. Each trainer has their own experiences to draw from when they give a training course and over time, their own experiences will alter their training session and bring new input to it. As a private Suzuki teacher working in isolation from other studios, I find it inspiring to retrain for a unit. It gives me new ideas, fires me up to try new things with my students and everyone benefits. As an educator we must all thrive to improve our teaching over the years. Teaching is not a static activity; we are constantly trying to figure out ways to teach individual students who have individual issues. The more we learn from others, the more accomplished a teacher we become. We need to also be lifelong learners, in order for our students and parents to benefit. In many ways, what I took away from that week together was confirmation that I was on the right path. I also took away a million new ideas for how to introduce certain techniques and how to follow them through as the student develops. I really can’t wait for the next opportunity to give myself this kind of shot in the arm. I know my students have all been benefitting as well from the inspiration, dedication and love for teaching that Doris each of the members of our class. I highly recommend to anyone who is feeling a bit “stuck” in their teaching or also anyone who is feeling isolated. Just sign up for a course with a trainer you’ve always wanted to work with. There is so much to be gained, especially from a course you have already taken. Chances are, the first time you didn’t have many students at that level yet. Now that you’ve taught that repertoire or level, you probably have many more questions that you’d like to ask. The unique quality of the Suzuki Method and our emphasis on cooperation rather than competition flows through our teacher training courses. I believe that just as much can be gained from the time spent over lunch or dinner with colleagues as from the actual course. You will be amazed and inspired by the other teachers in the course . . . and who knows . . . you might even find your new best friend! I have been teaching Suzuki piano for 33 years here in Colorado. Throughout the years, I have been attending Suzuki Institutes throughout the country as both a parent of two children who played piano, then viola and violin, and as a teacher, looking for learning all I can about the pieces in all of the books. I have taken some of the books multiple times, as I have found that each teacher trainer provides a unique perspective to both the pieces and teaching in general. I am able to then find out so much more about each piece and how to present it to a student. I have found that I am always re-energized by attending an Institute and being around fellow teachers and educators. When the new International Editions were released, I was excited to return to the Colorado Suzuki Institute to learn about all of the new repertoire. I enjoy the challenge of learning about new material, and I find that all of the different teacher trainers have so much to offer in their own way. Another plus is the observational component of taking teacher training. I gain so much from watching different teachers working with the students (even on different instruments)! So I would encourage any teacher to go back and take a book again, whether it be Book One or Book Seven. What a wonderful opportunity the SAA gives us with the excellent teacher training it provides for every teacher! I have found it very inspiring and motivating to study with many different trainers over the years. Some have aligned very much with my own approaches and thinking and so I am able to use immediately in my teaching the things that I have learned. Others have challenged my thinking and sometimes, I have to experiment and test out their ideas before making decisions about how I can implement what they have taught me. Sometimes these challenges reinforce my thinking and my approach with a renewed conviction. Taking summer institute units gives a rich opportunity to observe many excellent teachers with many approaches and ideas. In the case of violin, it is imperative that teachers take the time to upgrade their pedagogy with all the recent revisions. It is a challenge for many of us who have been teaching for a while, but also an exciting opportunity to renew our thinking and approach. With the advent of much technology, we have a chance to grow tremendously and reach the new generation of students in many new ways as well. The other very important point that I want to make about taking units again is the opportunity that experienced teachers have to share with younger teachers. The SAA is a community of learners, older and younger, experienced and newcomers, this makes this association so unique in the world of education. For those of us who were fortunate to learn from Shinichi Suzuki in person, it is imperative to keep alive what he was like as a person, and what better way than to keep participating in teacher training classes and workshops, and talk about as well as demonstrate his ideas in our playing and in our stories? I decided to retake previously registered Violin Courses as it had been fifteen years since I had completed a long-term training course. I learned that some highly respected teacher trainers, including Michele George and Doris Preucil, were offering courses in my region and was eager to study with these acclaimed teacher trainers. I strongly encourage Suzuki teachers to retake a previously registered course, as we are all Suzuki students.It is important to pursue continuing education and to challenge oneself, regardless of previous accomplishments. For the same reasons that students benefit from attending Suzuki Summer Institutes, teachers benefit from retaking registered courses.These reasons can be summarized in three ways. First, by retaking a course or attending a Summer Institute, we gain different perspectives on repertoire, technique, and teaching and learning styles. The second beneficial reason to retake a course or attend a Summer Institute is to establish social connections with like-minded colleagues. New personal connections can be inspiring, motivating and rejuvenating. The third beneficial reason to retake a course or attend a Summer Institute is to learn new innovative changes initiated by the SAA. We may attend workshops, attend faculty meetings, read the American Suzuki Journal, or attend the SAA Conference, but nothing can replace the time spent in an uninterrupted training course. For these reasons, retaking a previously registered course is an invaluable experience. Taking the same unit course from different teacher trainers has allowed me to benefit from their varied personalities, educational backgrounds, experiences, and viewpoints. This also aids me in making Dr. Suzuki’s quest to continue learning to be a better musician, teacher, and to discover ways to make learning easier for the child my own. I have studied Suzuki Violin Books One through Eight several times with different teacher trainers over the past 12 years. I believe that it is invaluable that we teachers continue to educate ourselves just as we diligently educate our students.One way to accomplish such a task is to seek out advice and knowledge from those who are very experienced in teaching. In addition, there is “more than one way to skin a cat” and each teacher trainer provides their own unique perspective toward teaching. I enjoy delving into each of their teaching methods and then extrapolating what I think will work well with my own teaching style. I still have all of my notes and observations from over the years and just recently in fact, I had the ultimate down-time and was able to peruse some teaching ideas I may have forgotten about. In the end, I learned that there is so much more to learn! How has the Suzuki philosophy of life-long learning benefited you as a teacher? Share in the comments!